E.J. Manuel will miss the rest of the preseason with a knee injury, meaning Kevin Kolb may be the starter in week one. But when both QBs are healthy, who deserves to win the job? With an injury to Kevin Kolb, E.J. Manuel saw a lot of game action in the first week of preseason against the Colts. 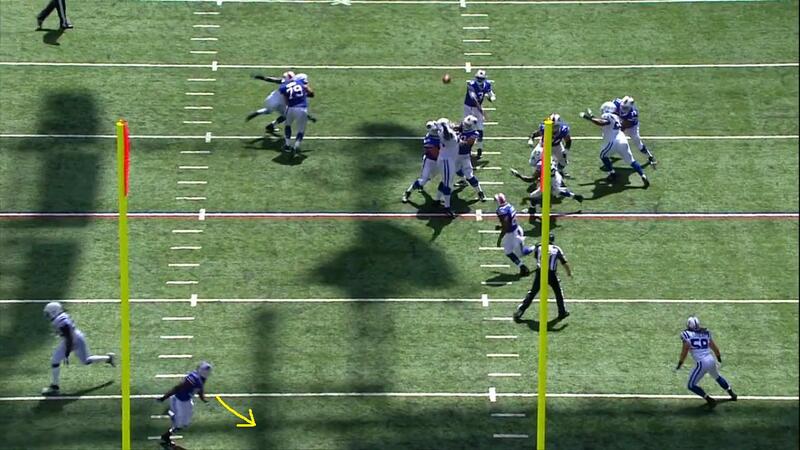 As I mentioned in last week’s article, the Bills will use C.J. Spiller early and often this year and there was evidence of that in game one as they fed him the ball on their first three plays; two of which he took for first downs. 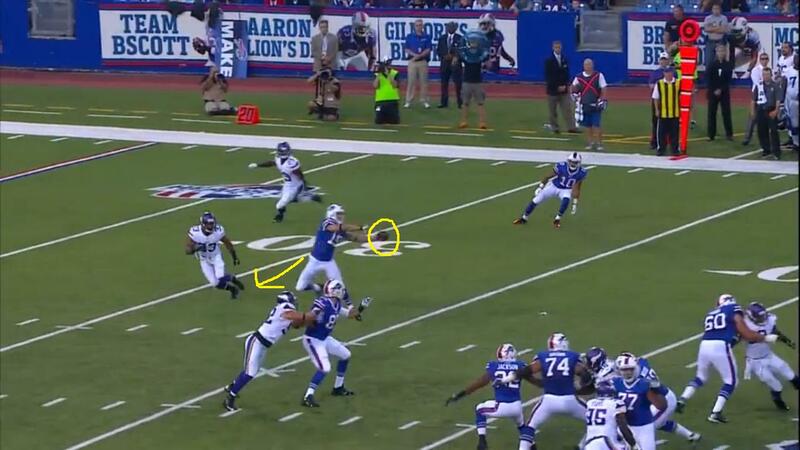 However their opening drive, Manuel’s first as a Bill, did not result in any points. He looked like he was finding his feet in the first quarter, and while most of his balls were thrown very well, he wasn’t able to move his team down the field. However, with 1:50 remaining on the clock before half-time, he took to the field at his own 8 yard line and orchestrated an excellent 11 play, 92 yard drive for a touchdown. Manuel displayed good timing and decision-making and capped off the drive with an excellent well-placed ball to his tight end Dorin Dickerson down the seam for an 18 yard touchdown. Manuel hits his receiver in stride for a touchdown. The Bill’s second game of the preseason saw Kevin Kolb start the game as the quarterback, and his first outing was not pretty. He started his first drive with a wobbly throw at the feet of Spiller, and his second drive was even worse as he threw another misplaced pass on 3rd down; this one resulting in an interception. 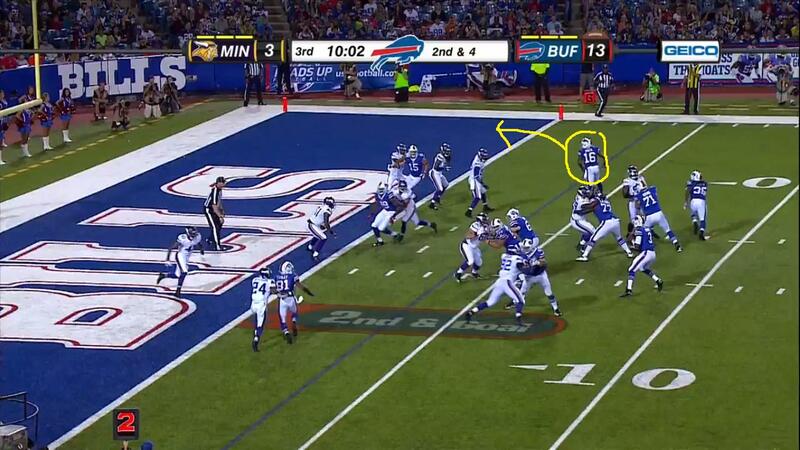 Kolb stayed in the game until half time, but only managed to lead his team to 6 points on 7 drives. There were a couple of good moments, but there were even more mistakes by Kolb, including bad decisions and poorly thrown balls (often behind the intended receiver) eventually leading to boos from the Buffalo crowd. Kolb throws behind his target who was running across the field. Then, to start the second half, on came Manuel. On his first drive, he threw a perfect slant route to Marcus Easley; providing a breath of fresh air compared to what we’d seen from Kolb in the first half. Manuel had the benefit of playing against the second and third team defense, but he made quick throws and moved the chains effectively; his first drive resulting in a touchdown on which he showed his composure. Manuel started the play looking to the left, but kept his eyes and feet moving and found Brad Smith in the right corner of the end zone to complete a 14 play drive. Who should win? E.J. Manuel - Manuel has the most talent of the two quarterbacks and he certainly has more of an ‘upside’ than Kolb. If it wasn’t for his injury he would be starting in week one, and don’t expect it to take him long to reclaim the starting job. Who will win? Kevin Kolb - Kolb will most likely be starting in week one simply because of Manuel’s injury. It will be very hard for him to hold onto the job without playing ‘lights out’ and benefiting from Manuel missing any extended period of time.